Cuirass with tassets for hips protection is made in style of the late XV – early XVI centuries. 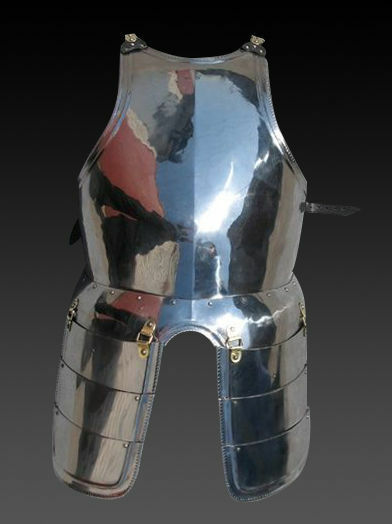 Typical features of metal body protection of those times were roundish shape and short skirt (faulds). Plate cuirass consists of the breast and back plates, which are joined together with leather belts, installed on shoulders and sides of armour. Such design allows comfortable wearing of torso protection. 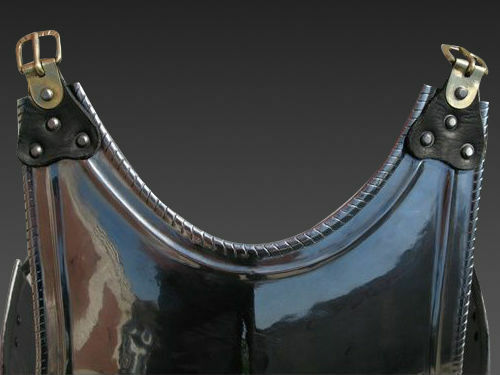 Segmented tassets are attached to the lower part of skirt and protect the front side of knight’s hips. We recommend to wear this medieval plate armour over the thin padded doublet or gambeson for better comfort and protection. 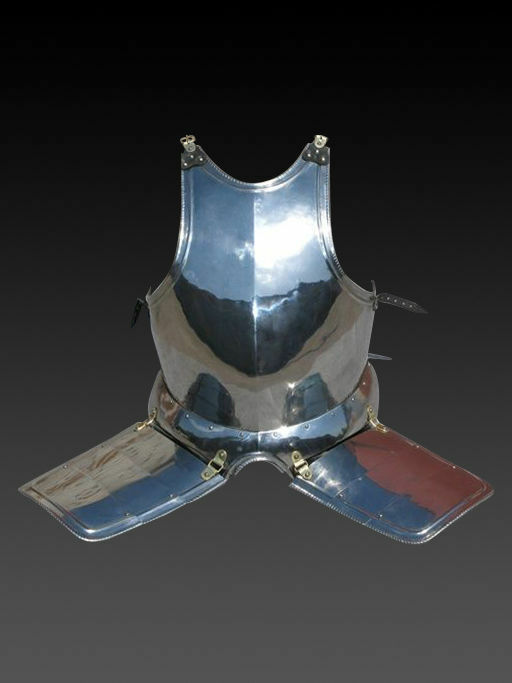 This Italian-style cuirass is manufactured by personal parameters of customer. You may also like these models of Italian style body armor with hips protection: Milanese cuirass with the skirt and tassets of the 1460 year; Milan-style cuirass of the 1450-1485 years, a part of “Avant armor”; plate cuirass with tassets, a part of the jousting knight armor, XVI century. Leather sleeveless gambeson When a man chooses protective outfit, including a gambeson, he always has to decide between two things – protection or mobility. Even though there is no medieval ultimate fighting on a short-term horizon, but you need body protection, which does not restrict movability, but looks as an expensive doublet at the same time... So, here it is – awesome model of gambeson, casual, comfortable and kingly classy. It protects owner’s body well, even though it is designed not for a hot fight. There is one of the best representatives of HEMA gambeson, which doesn’t limit your moves, but safely covers the body. Lining is made of firm linen; natural wadding (50% cotton and 50% wool) for protection against hits; two layers of the best leather for outer layer and vertical or diamond-shaped stitching for your choice. Stand-up collar protect a neck; five leather belts with buckles fasten gambeson armor from the front. This plain, reliable and high quality sleeveless gambeson may serve you in the battle an..